Before I went off to Australia, I was invited to attend an event at Bodega’s in Birmingham, which I was rather exited about, having been only once, with all good intentions to return at some point. 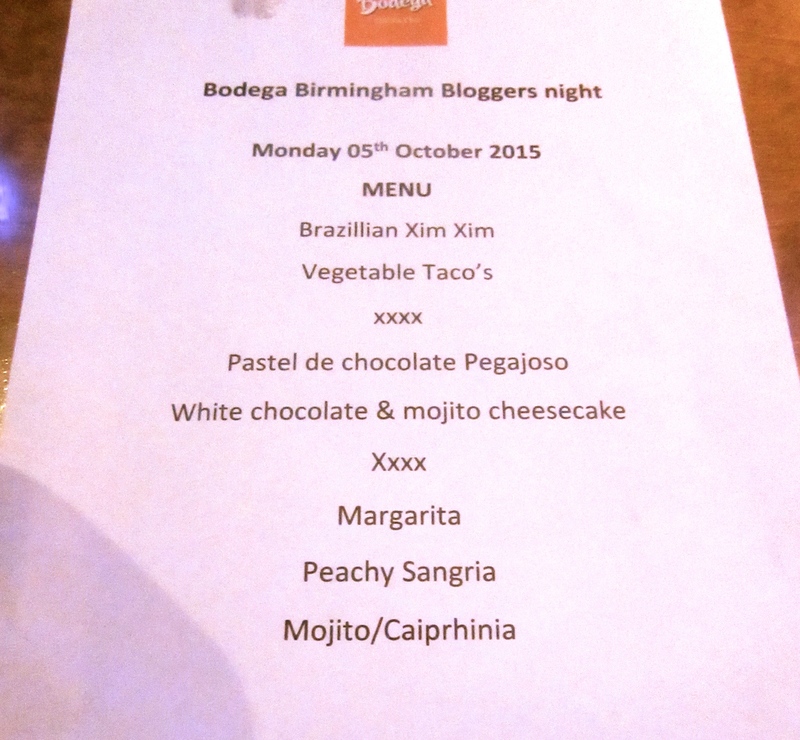 Along with some fellow brummie bloggers, we went along to try out some different dishes on their menu and also had a short tequila history and lesson, along with a few tasters, which unfortunately I could not partake in due to the fact that I was driving. I will never make this mistake again! What I love about these sorts of events is the chance to try something different. So on the menu that night we had Veggie tacos, Mango salad, Brazilian Xim Xim, Dirty Rice and for pudding we got to try their White Chocolate and Mojito Cheesecake and their gluten free Pastel de Chocolate Pegajoso. All the dishes were delicious, so much flavour going on, with lots of different textures and spices. 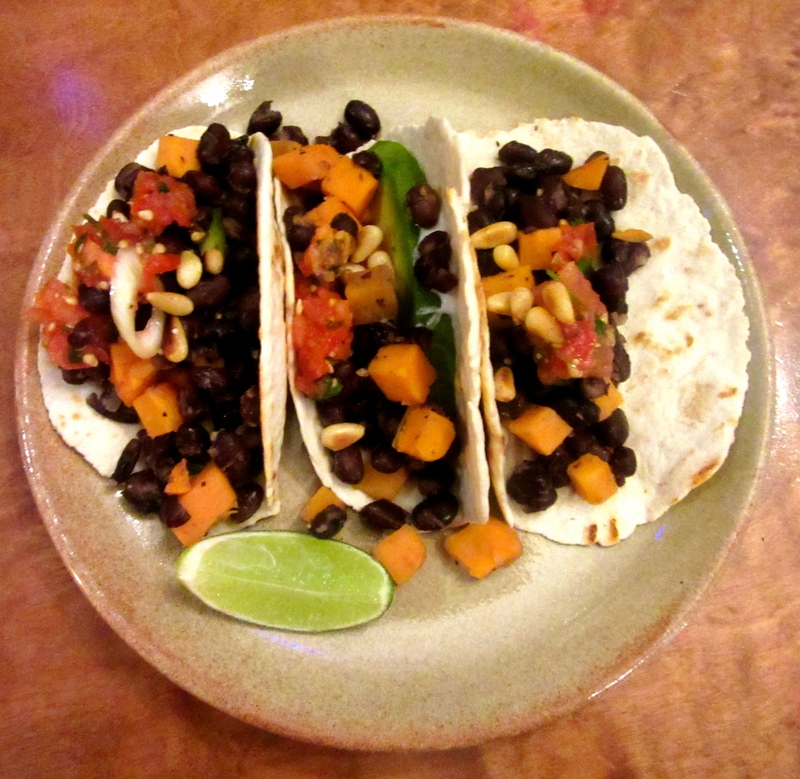 Veggie tacos – I would never think to order veggie tacos, however these were flavoursome and had a good bite, with avocado, sweet potato, black beans and pico de gallo salsa, a perfect little appetizer. 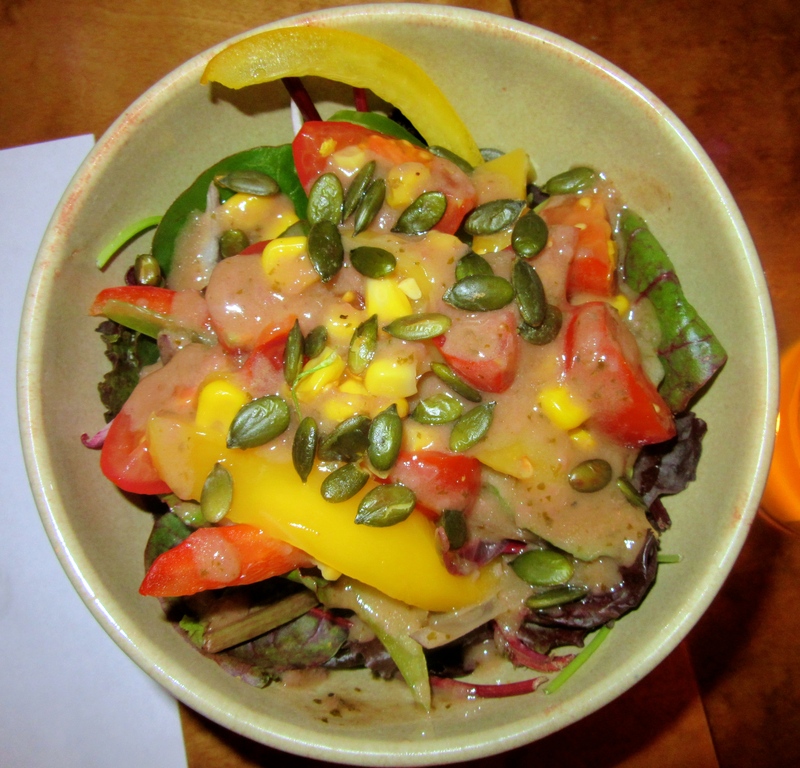 Mango Salad – again, I rarely ever order a salad when I go out, I mean when I go out its usually a treat, but this dish was very much a main attraction with mango, mixed leaves, cherry tomatoes, pumpkin seeds (which added a real nice texture), sweetcorn and a raspberry vinaigrette. You do have the option on the menu to add chicken, so definitely one to try again. Brazilian Xim Xim – now I hold my hands up, whenever I have been to a South American or Mexican restaurant I ordinarily order the burrito and would never think to try anything different, don’t ask me why, because I am usually quite adventurous when it comes to food. Well, after trying this bad boy, I think I will definitely be branching out with my food choices again. This dish was amazing! Full of flavours from the peanut butter sauce, oh the sauce, it is the sauce of many of my dreams lately. 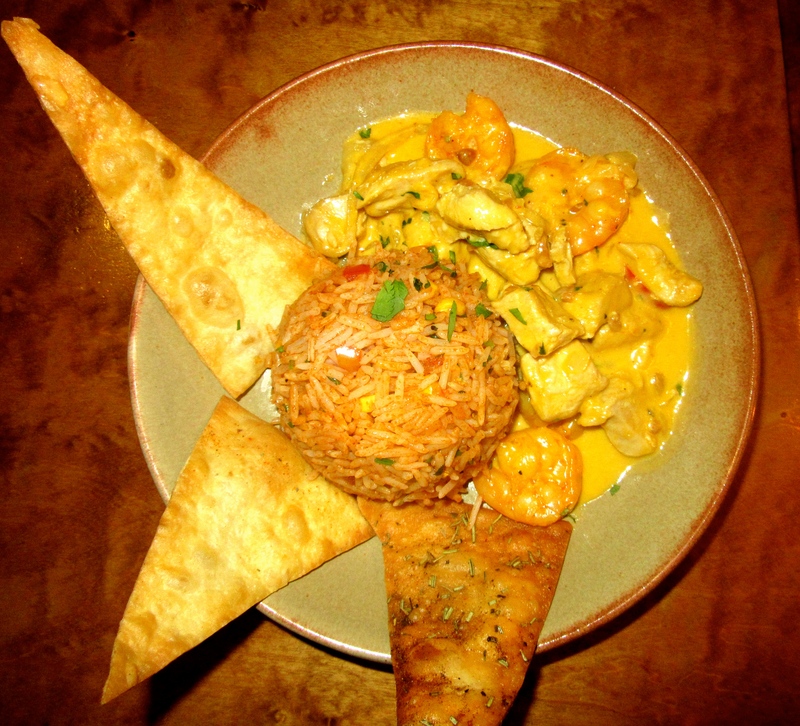 Xim Xim, is apparently an Iconic Brazilian dish and I can see why, with chicken and prawns in thick creamy peanut butter sauce, it is one I aim to try in full when I return. It comes with Dirty Rice! Dirty Rice – I tend to eat quite a bit of rice and never really order it when I go out, unless it is a risotto or paella, but this rice was pretty awesome. Flavoured with paprika, it also had diced peppers, onions and sweetcorn in which added to the texture and the flavour. It was very moorish and with the Xim Xim it was one heck of a dish. The puddings were pretty great too. 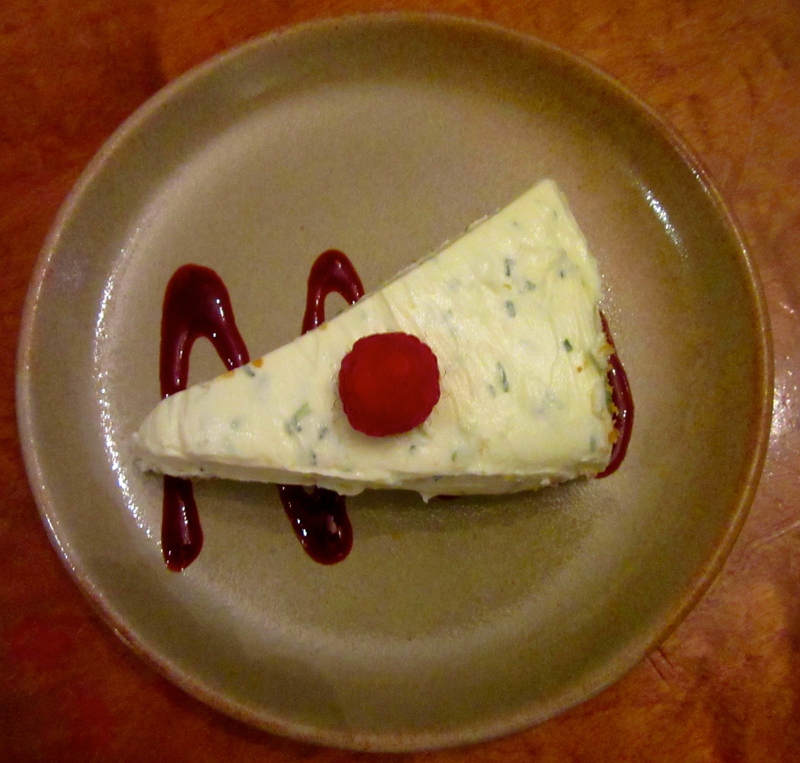 The White Chocolate and Mojito Cheesecake was my favourite type of cheesecake i.e not a baked one, but light and fluffy in texture with a nice crunchy base, with just enough mojito flavour without it being to alcoholic. But my favourite had to be the Pastel de Chocolate Pegajoso. For a gluten free option, this did not disappoint. It was a perfect chocolate pudding where the texture coats your mouth with deliciousness!! The nutty flavour came through with the addition of a pistachio praline. Just heaven in a pudding! I would love to be able to comment on the cocktails, as they all looked amazing, but I will just have to pay Bodega’s another visit so I can report back to you on those! It’s a hard life!! 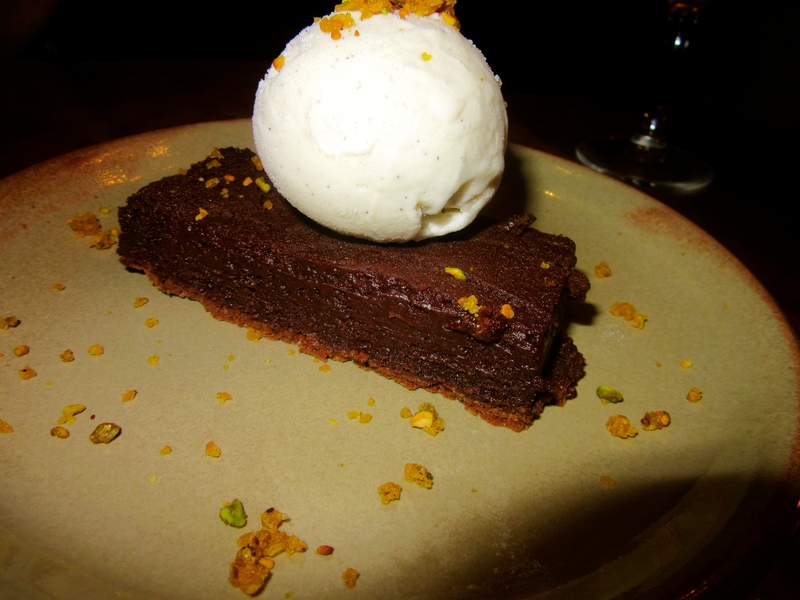 Have you paid Bodega’s a visit, if so what did you think and any recommendations as to what to have from the menu next? Disclaimer: I was invited to Bodegas as part of a blogging event, and therefore received my meal free of charge. However, all views in this post are mine and I was not in any way obliged to write this post.